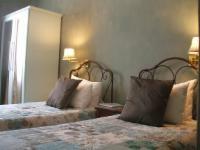 De Langenhof Guest House is situated in the picturesque Riebeek Valley, less than an hour's drive from Cape Town. The elegant country accommodation is set in a mature garden with restful water features and ample space for quiet reflection. Enjoy breakfast on the veranda, or in the comfortable lounge by the fireplace in winter. 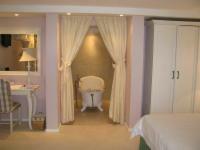 Beautifully decorated en-suite rooms are fitted with quality linen, air-conditioning, Satellite TV & DVD players. Relax at the large pool and quaint pool house. The ideal place to get away from it all and enjoy the slow pace of country living! Short but very pleasant stay. The hosts were very helpful and friendly.Establishment's Response:Dear Mariette,Mike & I are pleased you enjoyed your stay with us and hopefully we can host you again in the future. All the best for 2017. 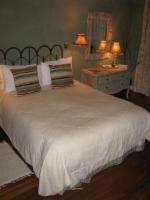 We enjoyed our stay at De Langenhof Guest House. Our room was very comfortable and clean. Thanks to Mike and his wife for all the evert. De Langenhof was stunning, we had a great stay. Loved it! It was fantastic to have a break from the hustle and bustle in a quiet and peaceful environment. We enjoyed the welcome Allesverloren Cape Ruby that put some heat into us after a fairly chilly morning. The room was perfect and so were the breakfast's. The large veranda is very inviting and we spent a lot of time sitting there. Heaters are available for the cold when needed. We really had no complaints and Mike and Gail made us feel very welcome. De Langenhof Guest House is 0.2km from the centre of Riebeek West , the nearest airport 75km (Cape Town International Airport).